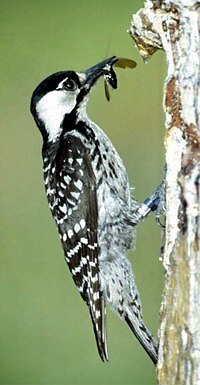 Leuconotopicus borealis a zo ur spesad evned eus ar c'herentiad Picidae. Anvet e voe Picus borealis (kentanv) da gentañ-penn (e 1809) gant an evnoniour gall Louis Jean Pierre Vieillot (1748-1831). Bevañ a ra diwar amprevaned-koad, biskoul, c'hwiled, kevnid ha merien hep ober fae ouzh frouezh ha hugennoù gwech an amzer. Kavout a reer ar spesad e pinegi gevred Stadoù-Unanet Amerika. Renket e veze er genad Picoides kent. (en) Leuconotopicus borealis war al lec'hienn BirdLife International. (en) Leuconotopicus borealis war lec'hienn an International Union for Conservation of Nature (IUCN). ↑ (en) Leuconotopicus borealis war al lec'hienn Avibase. Kemmoù diwezhañ degaset d'ar bajenn-mañ d'an 30 Gou 2016, da 16:53.